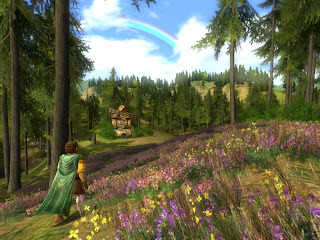 Over the weekend I had a chance to participate in a closed beta stress test of Lord of the Rings Online (Turbine). As a result, I feel the need to share my feelings regarding not just this game, but The Lord of the Rings in general. It may come as a surprise that I am trying out an MMORPG again, especially after my somewhat strong thoughts in opposition to WoW. This game, Lord of the Rings Online, is different for me though. When I first came to the US so many years ago now, and began learning English, the first book I read in my, at the time, new language was The Hobbit. It took me forever to get through it with my dictionary, having to look up so many words I did not understand. The fact that Tolkien's writing style is old made it that much more difficult. Still, I fell in love with the characters and the world. Shortly thereafter I started reading The Lord of the Rings, and with less difficulty. It still took me a long time to get through the first book, but the second and third were much easier. I suppose you might say that it grew into somewhat of an obsession for me, dreaming at night of running through the forests of my former homeland as an elf. This was another badge of nerdhood I have carried on my chest. I was fascinated by Middle-earth long before it become cool on account of Peter Jackson. Before the MMORPG games that we now know, Middle-earth beckoned me to join the fight online in a different way. What must have been my first online gaming experience, my heeding the call of Middle-earth, was a MUD called MUME. I confess I didn't last long. I played for a few months, and managed to gain a few levels, but the high difficulty and steep learning curve got the better of me. MUDs are not for the faint of heart to be sure, and that was one nerd badge I would not win. All the same, my brief excursion into MUME was very enjoyable. What I enjoyed the most perhaps was the realism of my character's mortality in the form of being weak and having to eat and drink lest he die of hunger or thirst (something you never see in games anymore). The chance to exist in Middle-earth, however, was the biggest reward. The role-playing was nice, and I must say that from current experience people don't seem to role-play much anymore even on dedicated RP servers. This brings me to my most recent experience of Lord of the Rings Online. I tried all available character races, starting out as an elf. I always play an elf. I made up my mind, long ago during one of those nights, that I was an elf actually. Somehow that stuck, and I have maintained this illusion for many years. Yet for some reason I was not thrilled with being an elf anymore, and maybe it's all thanks to the movie's interpretation of Legolas. Just maybe it took the fun out of being an elf for me. And so, I found myself sticking with the Hobbit. An uncharacteristic choice perhaps, but playing a Hobbit burglar was much more enjoyable to me. I spend a couple of days running around the Shire, meeting various shire folk. Some familiar names even, which was always a pleasure, even when it was Lobelia Sackville-Baggins. My brief foray back into Middle-earth reminded me of all the things I cherished about this universe that Tolkien has created for us. Even if Lord of the Rings Online is quite similar in mechanics to other MMORPG games, the fact that it takes Tolkien's writings to heart in creating an accurate representation of Middle Earth pleases me. Being able to experience this universe yet again intrigues me. Thus I may actually venture forth unto Middle Earth once more when the game becomes publicly available.